The first production capacity of the enterprise “Chernigivryba” was built in the 50’s of the last century. Then, during the reconstruction of Chernigiv after the World War II, it was decided to place a new industrial area on the outskirts near the village Podusivka, within which was built smokehouse and warehouse handler for salted fish. It was not yet a complete fish processing production, the main purpose of business was the distribution of salted fish that have been brought to the trading network of Chernigiv region. The smoking plant was considered simply as a means of conservation of salt production in order to extend the implementation. But to the honour of builders who created the company in those days, it is necessary to say that smoking chambers that was built more than 50 years ago, after some repairs and refittings are still working. 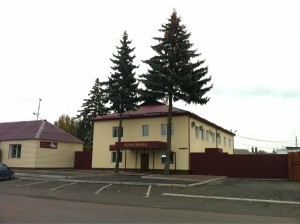 Now “Chernigivryba” uses classic technique of smoking fish, which requires great man-hours and staff, but provides unrivaled “natural” taste of products. In the late 60’s there was carried out a large-scale reconstruction of “Rybzbut” as the company was called at that time, there was built a workshop for salting fish. But above all there was built a refrigerated warehouse cooler on 1200 m2 of railway access roads. “Rybzbut” has become a full-fledged fish processing enterprise, which has been able to conduct a full cycle of production of fishery products from import frozen raw materials and its processing into a various products (salted, dried fish, hot and cold smoked). During the 70-80’s there was conducted individual expansion of production space, upgrading various types of production and auxiliary equipment, modernization of the fleet, that made the company the largest manufacturer and supplier of fish products in the Chernigiv region and often worked in night shifts. In the 2000 the company was made not so much in volume but very significant technological upgrading – replaced by ammoniac refrigeration equipment by modern freon, thanks to that the company ceased to be a potential man-made threat to the city and the environment. Today the company “Chernihivryba” thanks to the found investments carries out repairs and refitting production capacity, brings the production conditions to all requirements of the regulations. The company’s products are determined by the highest quality and, thanks to the continued application of classical processing technology, the best flavor and safety for the consumer. Today the company “Chernigivryba” is located in the industrial zone of 5 minutes drive from the center of the Chernigiv with convenient access to cargo transport from all transit roads that are suitable to the city. The territory is separated and forms 2.14 hectares. There are eight buildings of the company, including fish shop total area of ​​1400 m2 (with specialized refrigerated room area of ​​120 m2 for salting fish, 8 smoking and 2 stockfish chambers), the building of the refrigeration warehouse total area of 2120 , cargo ramp of 10 car seats (including the area directly refrigerated warehouses around 1000 m2 multi-temperature according to the technological needs – from-20C to-180C), 3 warehouses and subsidiary buildings with total area of ​​1749 m2, transformer substation, building shop, a two-storeyed administrative building total area of ​​285 m2. “Chernygivryba” has its own fleet of 10 specialized trucks with termfourgon and refrigeration equipment capacity from 600 kg to 13.5 t.
The company has its own laboratory, so all fish products are subjected to incoming veterinary and sanitary control and quality certification conducted by the State Committee on Standardization, Meteorology and Certification of Ukraine. Today the company operates in Ukraine with a vast network of retail stores, with sanatorium-preventorium, with children’s recreational facilities, with children’s health institutions, institutions of the Department of Education, institutions of the Main Department of Social Welfare. Products are produced by real masters – professionals. Staff selected from qualified professionals. The company always has a sufficient reserve of fresh frozen fish and seafood only high quality! Species composition varied fish: salmon, chum salmon, pink salmon, halibut, mackerel, herring, capelin, pollack, hake, walleye pollock etc. Such a choice is determined, above all, by traditional consumer demand. Our consumer is adequately assessed the quality. Our products can be bought in almost all stores in Chernigov and in the supermarkets of other cities. Soon the company plans to expand the geography of supply. We hold promotions and tastings to improve sales of our products. That’s why everything is so tasty.